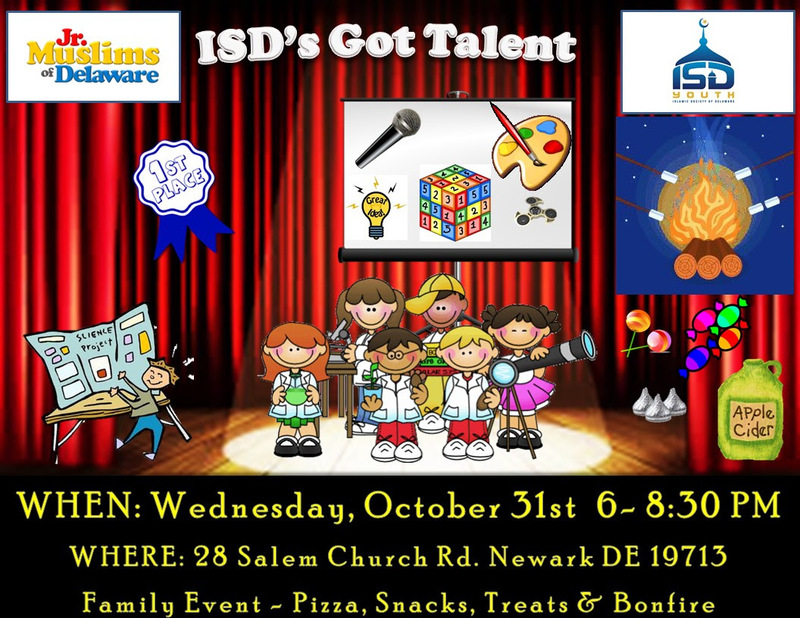 Islamic Society of Delaware Youth Group would like to invite the community for a fun-filled family night at ISD on October 31st from 6 to 8:30 pm (Rain Date: Saturday November 3rd). The program will begin with Jr. Muslims of Delaware and Youth Group showing their talents. A panel of judges will provide their comments and select a winner, who will receive a $50 gift card. Kids of all ages are encouraged to participate in the Talent Show. The auditions will be conducted on Sunday 10/14 and 10/28 (10:30 am - 12:30 pm) to give all participants a chance to show their talents. The finalists will perform on 10/31. Afterwards, the families will get to enjoy pizza, treats and bonfire with marshmallow roasting.